hrl: was engaged by PT Lestari Banten Energy, in Indonesian, to conduct an investigation on a boiler superheater tube. Following the completion of the site and laboratory works, hrl: visited the plant to provide a complementary face to face discussion with the decision makers to a satisfactory outcome. 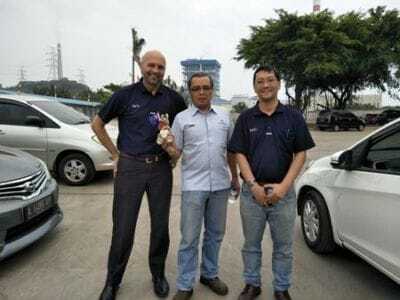 In picture, Steven Kulibaba (General Manager hrl:), Agustinus Sunarto (PT Lestari Banten Energy, Head of Maintenance) and Ken Sidharta (hrl: Lead Engineer for the work). Learn more about failure investigation services here. About: Over 10 years of experience in the area of root cause failure investigation, corrosion studies and condition assessment of plant structures, high temperature equipment, pressure vessels, piping and fire damage.